Molar mass averages can be affected by changes in the environment and measuring conditions. Generally, these variations are the result of one or more factors including flow rate reproducibility, baseline drift and injection reproducibility. In addition to controlling column temperature, Tosoh engineers added temperature control for both pumps and inlet and outlet tubing on the EcoSEC GPC System to deliver top GPC analysis performance. Figure 1 demonstrates the superiority of the EcoSEC GPC System for the determination of weight-average molar masses. 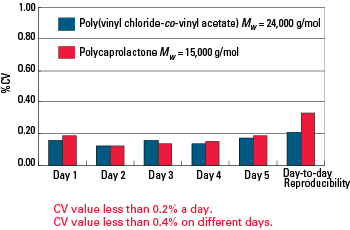 Figure 2 shows a comparison of Mw reproducibility for a sample injected 10 times a day for 5 days on the EcoSEC GPC System compared to a conventional GPC. 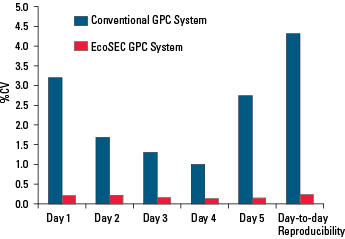 The reproducibility of the EcoSEC GPC System was superior by a factor of 3 to that of the conventional GPC system.